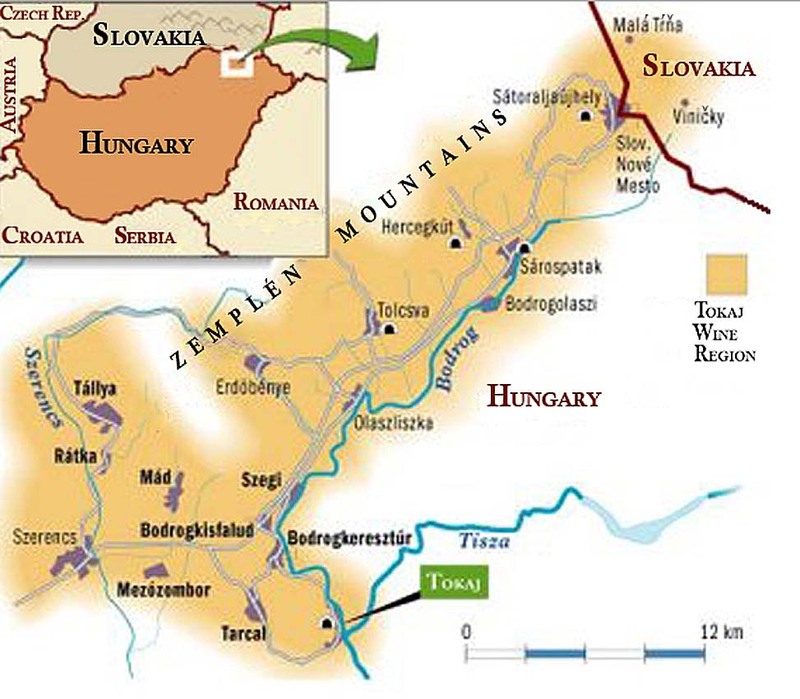 The Tokaj region may be felt like an established wine region from abroad due to its documented tradition in the past centuries but oddly it's also a very dynamic region in terms of young artisan winemakers, it'l like if Burgundy met Touraine or Anjou, and there may be several reasons behind this, one of them being possibly the socialist interlude during which the parcels on the slopes, the equivalent of the Burgundy climats were abandoned under the post-war communist rule in favor of massive plantings on the flatland for productivist efficiency : Since freedom of enterprise came back around 1989, daring vignerons had all these slopes (then covered by bushes and woods) to reconquer with great potential for making quality wine again. You can see on the pic on left that the slopes and terraces are being restored but woods still occupy large swaths of the prized terroirs. Tokaj as a small town retains something of his old glory, it is architecturally beautiful, especially compared to the villages in the flatland (some of them still have this communist-rule touch in the landscaping and destitution feel. Judit Bodó like her husband József who started their Tokaj pince (domaine) in 2005 is originally from Csallóköz, Slovakia just north of the border from Hungary, she's Hungarian speaking as her home region like many satellite regions around Hungary was part of the Austrian-Hungarian Empire prior to 1920. She first landed in this region in 2000 when she came along her employers from South Tyrol who were in the process of starting a winery here. She had initially gone to South Tyrol to better her language skills in German and get some work (as babysitter first) and ended up picking fruit and working in a winery. Having trained in winemaking and vineyard management with her new employers in South Tyrol she could help them with her cultural and language skills through the administrative hurdles of establishing a domaine in Hungary and book keeping. 5 years later in 2005 with their first child coming, Judit and József decided to launch their own winery, Bott Pince, and they bought their first hectare in the Tokaj region. She was to become a rising star on the Tokaj wine scene. After starting with one hectare in 2005 Judit and József grew to 2,5 hectares then 5,5 hectares reaching progressively the present-day surface of 8 hectares, all planted with white varieties of course, mostly Furmint and Hárslevelü. What is important to know is that 15 years ago when she arrived here in Tokaj with her Austrian employers there was virtually no quality winemaking in Tokaj and she is thankful to them for having taught here all the basics of real winemaking beginning with respectful vineyard management and relying on indigenous yeast for the fermentation. She remembers when she began to train local workers about pruning and green harvest in order to limit the yields with an aim of 1,5 kg of grape per vine (or 5 to 6 clusters), people whouldn't understand that she didn't want the usual 20 to 30 kg per vine, they couldn't believe why she was doing that, plentiful grapes were considered a gift from God and you couldn't refuse it. They had never worked this way and were not shy of showing their contempt for her vineyard management, telling her she was not from here and didn't understand the trade properly because of that, THEY knew better and she'd get nowhere working this way. 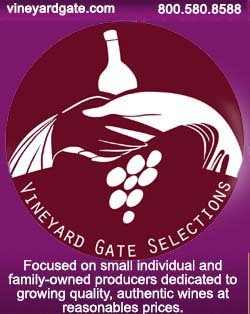 After this difficult start regarding the relation with locals (including other local winemakers/growers) things have improved over the years because people realize she and others like her have been getting great recognition for their wines, and they begin to consider restrictive pruning and grape selection as positive. Judit says that today there are more than 40 winemakers sharing this artisan pholosophy in the region, which is a huge change compared to 15 years ago. They found this cellar at the beginning when they started their domaine, they rented it at first and 5 years later bought it. Their original idea was to build their own cellar by their house but 2010 was a bad vintage with only 1000 bottles to sell, so gave up the new-cellar option and bought this one instead, doing some renovation work in the way so that she could do everything here. Now they're a team of 5 including herself and her husband, three other people working for them. Most of the work takes place in the vineyard, in the chai typically they press the grapes, then let the juice rest one night in stainless-steel tanks to settle the gross lees (it's usually 200 to 300 liters at a time). Then the juice goes through pipes to the barrels below in the cellar where it ferments by itself without the adding of any yeast or enzymes. She says that the potential of the wines lies outside, on what was done in the vineyard, there's the soil, the acidity and the structure of the wine, the Tokaj wines need nothing else. She says if you work clearly in the vineyard as well as in the cellar you got everything to make quality wine. Judit loves her Willmes press (pictured above), itt's from the early 1960s', maybe 1963 and 5 years ago they planned to buy a new pneumatic press but they had no money and the European funds devoted to help farmers were drying out according to the Hungarian administration, so they chose to buy a used press instead, actually she's so hapy with this one : unlike the newer, automatic presses which can follow the pressing and adapt through computerization, this one needs human control and she says it's better, because that's the last interaction with the grapes and it's even more important at this stage to be there in person and keep tasting the juice and decide without the help of a computer. You stay for 2 hours and with the juice and grape touch being different for each vintage it's very important to be there and listen to what the grapes and juice can tell. This press was standing still in the courtyard of her former employer in Süd Tyrol and she got it for little money. The chai is not very roomy for what is now a 8-hectare domaine, but picking is traditionally spaced in Tokaj and each day during the harvest season deals with a fraction of the whole picking. Judit excuses herself for what she says is a messy winemaking facility, but I rassure her that her French equivalents in terms of artisan-wine domaines are often much more messy and my readers don't look for sleek, state-of-the-art facilities... They went through a bottling sessions the days before and there are a few remains of this work, like a couple of demi-john containing the rest of the unbottled wine. She says that they live with the nature's rhythm, for example when it rains outside and they can't work in the vineyard then they find things to do in the cellar instead, and whatever the weather they're happy this way. Their first half hectare which they found in 2005 came with this cellar, it's located on the south side of the Tokaj hill. They wanted to begin with one hectare and what happened is that when she and Joszef decided to marry in 2004 they didn't want the usual wedding gifts (they had already all the house stuff) but told people to instead contribute money so that they could buy the other half hectare, helping them each their starting surface of one hectare. This other parcel is on the sourhern slope on the Tokaj hill. Asked who sells these parcels in general, Judit says that this one belonged to old people whose family didn't want to continue work with it. These people had probably kept tending the vines during the socialist regime and sold the grapes to the collective farms, making like everybody a bit of wine in a tank on the side for private consumption. Regarding the move from this first hectare top their present-day 8-hectare surface they were helped by an investor/partner who loves Tokaj and offered to help in acquiring interesting parcels when they showed up, they teamed up with him on this project and he offered a long-term rental for the parcels which leaves them full freedom to work in the vineyard, she says this partnership/friensdhip relation is very helpful for their domaine. One of these parcels, the biggest plot is Csontos (not the one on the picture here) and it happens to have on its grounds a very old press house which József who is himself has a training in Art history loved at first sight, the stone building was in derelict condition but they both envisioned the day when they'd take care of it with some renovation and make something with it. The vineyard was easier to get than this house, there were 12 owners behind it and one of them was reluctant to let it go. Now they could get it and have begun doing some protective renovation. Speaking of her wine-variety preferences Judit says that she likes the two, Furmint and Hárslevelű, the latter having sometimes more elegance than the former on some vintages. Furmint is easier in many regards, easier to sell, easier for many people beginning with the pronunciation of its name, but she regards Hárslevelű as very beautiful. Now on the 8 hectares there's 50 % Furmint, 46 % Hárslevelű and 4 % Muscat. With the long process of having the botrytis do its work on the grapes for the noble rot, accidents may happen like last year when they had the equivalent of 4 hectoliters of grapes still hanging in the vines, then came this 100-millimeter rain episode over the course of 2 days (october 24-26) and this potential batch of sweet wine was gone... Everyone in the region was afflicted by this weather accident, just the bigger wineries still had sweet wine from the previous vintage to sell. 2014 was also quite a bad vintage with so much rain throughout the season, double from average, and at Bott they made a total volume of 1200 bottles, or 10 % of the normal production. But for them 1013 was a very good vintage especially that this was the first year they had at the same time dry Hárslevelű, dry Furmint, late harvest, Szamorodni and Aszú [made with only the dried-out grapes]. Along the years as they grew their working surface they enlarged the cellar by a few meters, digging further into the hill for more room for the barrels, she says there's about 14 meters of loess above our head, atop which there's a vineyard.... The cellar wasn't that old actually, she says it was built in the 1970s' and now the whole cellar look the same age though because the mold conquered the new walls and vaulted ceiling as well. On their first vintage they just made two barrels, one dry and one sweet and today with 8 hectares if the conditions and vintage are good they can make 12 000 bottles. Judit says that this is a very small barrel cellar in regard to other wineries around and she says Tokaj has a few impressive old cellars, like 300 years old. They've just completed the bottling of the 2015 dry wines, Judit said that in 2015 the fermentation lasted 4 weeks which is normal (in the range of 4 to 6 weeks) but she has 2 different terroirs and 3 different wines with which the fermentation lagged into late march, early april, this was unusual to wait 6 months. She thinks that has to do with the very dry weather of 2015 and so the yeast were a bit tired. But the wine ended tasting very well after this longer fermentation time. Asked if she was anxious with this longer fermentation, she says her experience is not long enough so this episode came as a, unsettling surprise, but she tends to take what nature offers and anyway the wine always tells through the tasting how it fares, and this time all along this lagging fermentation it was giving nonetheless good signals and she felt comforted because of that. Asked how she sells her wine she says it's very easy through her newsletter, and also she travel sometimes to Budapest where Terroir club is distributing her wines to several high-end restaurants, among them Onyx (see wine list), Costes, Borkonyha (click on wines to see the wine list) and Csalogány 26, all being to tables for food and the wine list. For certain cuvées in high demand she has to limit the allotment for buyers. Asked if because of higher demand she could augment her surface, she says no because she wants to be sure to be able with her husband and team to manage the thing, and they reached the limit with 98 hectares especially that they'd like to open also a panzio (bed & breakfast) like it's the norm in many Hungarian family domaines, and, last but not least, Judit and József raise now three children... Speaking of the children she says if they feel they want to work in the wine trade too in the future, it'll be up to them and they will do it in their own way and choice. She says 12 hectares would change their life drtamatically, they'd be overstretched and they'd have not this quality relation with the vineyard. And asked about buying organic grapes to some neighbour and make what we call in France négoce wine, she says you just don't find growers who work like they do : they keep grass in the vineyard, they just spray orange oil, energy conzentrat [Biomit Plussz if I'm right] and sulfur, they stopped using copper and if they bought grapes they'd not have this same quality. We had a tasting of the wines before going to look the vineyards, Judit reminded me wisely that in Hungary you have to have zero alcohol in your system when you drive (in France you can drink the equivalent of 1 to 2 glasses i think), so I'd better have time before I take the wheel of my rental Peugeot 301 again. This said, the Hungarian police didn't seem very threatening to me compared to France where the Gendarmerie do routinely breath checks in the back roads. I wouldn't go far anyway I had spotted a campsite right outside Tokaj alon the Danube and wouldn't come across police checks in between. I strongly recommend the place (Tiszavirag Camping) by the way, it's just on the other side of the bridge on the left, it has good functionning showers and bathrooms (if communist-era old) with hot water, friendly log restaurant & bar with wifi and a night cost only 1800 Forints tax included for me, the car and the tent (5 €). I brought my ultra-compact & discreet tent that looks more like a sarcophage and slept very well (summer is real summer in central Europe with nice weather most of the time). They also have a few cabins if you don't have camping gear. And to make this place even look better, the best wine restaurant in the area happens to be next to it (50 meters, you can go by foot), it's Halra Bor Etterem and Judit said that was the one place to go to. Sadly I showed up at 9:20 pm to have a glass and it closes at 9 pm. __ Buborek, Sparkling 2015 made with young Muscat (8 year old vines on a rich soil, higher yields), that's the first wine I had, very welcome because it was so refreshing in this hot day. The bubbles were mostly gone because she had opened the bottle a while ago but the vinous feel of the wine was even better, nice juicy mouth feel. In a few years the roots will dig deeper in the ryolit soil and this Muscat will grow in quality. This sparkling sells for 2500 Forints (8 € or 8,7 USD), good deal. __ Palánkos Furmint 2015. Easy drinking, aerial, light and subtle. 13 % alc. She made 1600 bottles which makes 1400 liters for this one-hectare parcel, planted with 4000 vine/hectare, 15 years old. This density dates from the communist era, now people plant with higher density. This is the 2nd bottling, the first was in march 2015. Sells for 4000 Forints (12,7 € or 14 USD). Judit says that this wine is lovely year after year, with this soft charachter and easy-drinking nature, it must be the terroir because she vinifies it like the others and it comes out always with this smooth side. Sells for 4000 Forints (12,7 € or 14 USD). On the table I spotted these bottles and as thought they're samples waiting to be collected by the wine administration. Judit says that for any given cuvée there must be 5 samples put aside, 2 bottles going to the blind tasting, the equivalent of our commission d'agrément where fellow winemakers check the wines, then if given the green light on the tasting stage the 3 other bottles are sent tyo the central wine laboratory in Budapest where they check the usual things (alcohol, pH, SO2 and so on). Speaking of the SO2 the ceiling is very high alas. She says at Bott Pince she uses less and less SO2, these days she has levels of 20 to 25 free SO2 and 60 to 70 total SO2. Asked when she adds SO2, she says first after the fermentation where she adds 30, and then before the bottling, depending of what remains in the wine she adjusts to get 30 or 35. On the incoming grapes she may spray sulfur if the vintage needs it, like in 2014 the skin was very thin and the juice turned brown quickly after pressing, so she added some 20 mg free sulfur. I tell her what I remember a winemaker told me in France, that if a white juice turns brown he never panics and the color returns to normal after a while, so they just let go and add nothing. That's when Judit tells me she's working with Isabelle Legeron right now and begins to make a cuvée with zero SO2. This sponsoring named The Collective works as follows, the group buys a given barrel of wine to a winemaker at its usual retail price with the condition that no SO2 will be added from A to Z, which helps the winemaker take the risk of vinifying without SO2 as the wine is already paid for by Isabelle Legeron and her group. In the long run it will convince these winemakers that it's feasible to work without the safety net of the SO2 and it will speed the change. She went to London for Raw Wine and to see what the consumers thought of the wine and they loved it, which gave her confidence, but she admits that she needs time to switch to no-SO2 vinification. She already made a barrel of Furmint and one of Hárslevelű but it's all going to London because the wine public here in Hungary is not ready to understand these sulfur-free wines. I ask if she'll do more of these wines if they sell well in London, she says yes. Speaking of the Budapest market she'd like to meet the restaurant owners where she already sells wine, next september, to explain the sommeliers about these SO2 wines, but she doesn't know what they'll say. __ Teleki 2015, made with Furmint and a bit of Hárslevelű (there are a few complanted vines). Vines are 70 years old, their oldest parcel. Loess soil with lots of chalk. Complexity on the nose with Berlingot aromas. Elegant wine with good length in the mouth, no spitting, I don't care about drink & drive rules.... Sells for 5400 Forints (17 € or 19 USD). In 2015 the berries were very small because of the dry weather and they had much smaller volumes. __ Kulcsár 2015, 100 % Hárslevelű, 40-year-old vines. Flatland located under a former volcano, it is said that the volcano lava made a carpet of lava that somehow landed on this place. With the erosion of the earth along the centuries you get a high concentration of this lava resurgence remaining in place, and working in this parcel is unseasy because you walk on a rocky, unwelcoming rocky ground. Interesting wine, flowery aromas in the mouth with peony-like ripeness. Feminine wine, not very long in the mouth but lovely. Some sugary feel, about 3 grams of residual sugar. The fermentation also lasted until march. I notice that she uses glass closures for her bottles, she says she used to buy quality corks in Portugal but wasn't satisfied with what she was shipped. In spite of choosing long, high-quality corks she kind of thinks that the cork makers don't ship the same quality if you're a winery in Hungary, or say, in Burgundy, even if both buyers will pay the same price [I heard the same concern here and there in France]. So she switched to glass closures and up to now she's pretty happy, she had no returned bottles like it happens with faulty corks and she just has to wait more years (10 years for example) to check the incidence on long bottle élevages compared to tree-bark cork. Judit says that for a few years they invited wine bloggers to come and spend a few days in the domaine in order to see how they were working, the only thing (which I'd have felt difficult to endure) was that she asked them not to write stories about it in their blog because they didn't want to make it a marketing thing, they just wanted to share their philosophy and hard work in the vineyard side with writers for whom it was maybe alien in terms of day-to-day challenge. The wine is quite incredible, very different from everything, exceptionnal, illuminates the throat. Hard to describe actually. And she says that in spite of a very different vintage 2015 felt the same, this is really a question of terroir. Sells for 6000 Forints (19 € or 21 USD). Judit explains me the repeated pickings they do, for Szamorodni there must be more than 50 % of botrytized grapes in a bunch, they pick the whole bunch and there will be some sort of competition between the botrytized grapes and the other grapes. They go 5 to 6 times in the parcel to do the picking, beginning to do the picking for the fry wine, then the Aszu berries (picked one by one) 2 or 3 times, then the sweet Szamorodni if the vintage allows it and lastly the late harvest. This is a lot of work indeed. Incidently, I ask Judit if they kept a day job at the beginning to help pay the bills but she says no, they had some government money then because they had their 1st child, and it helped really. She says that retrospectively these were hard times to go through but she never felt it like that, they had a one-room house with this healthy child and people were visiting them and encouraging them. This sells for 8000 Forints (for a 37,5 cl volume) or 25 €. A 50-cl bottle costs 15 000 Forints or 48 €. I ask about the export markets, in the United States it's Blue Danube Wine, in the U.K. it's The Winemakers' Club, plus more possibly through Raw Wine fair, then Sweden [name to come soon], plus private buyers in Austria and Slovakia. Her wines can also be found through Le Verre et le Vin in France. As said above, Judit and József got their parcels along the years, beginning with Elöhegy a 50-ares plot in Tarcal which they didn't pick for 2 years because there was so much work to bring the vines back into production. You can read this webpage about their parcels and terroirs with a few pictures. After driving a short distance from the chai we reach the Teleki parcel, it's a mixed plantation with Furmint and a bit of Hárslevelű which yields grapes with nice acidity every year. The vines are 70 and as you can see they're planted along posts the old way like I showed in my last story it was the norm in the past in the early 20th century including in Champagne. Judit says that they work with a horse here because there's only one meter between the rows and no tractor can pass. About one percent of the vines in the region are still planted on posts, it has become very rare here too. Unlike some vines in the region which grow high withb trellising, here the vine is very low, almost close to the ground with only the young wood going up along the post, I guess they prune it back down low to keep it this way so that the thick wood remains against the ground, she says that's the old way, like growers did 200 years ago. Now it's the time to bind the shoots to the post but it otherwise grows freely. This parcel which makes 0,6 hectare has wind all the time which is important for the health of te vine. It's southern exposed and sunny all day. For her recent replantings she didn't use the post system but she'll do it for a terraced parcel on the top of the Csontos climat, these are small walled parcels where the post system will be perfect. On the right you can se a vine with only 2 bunches of grapes, that's not uncommon on this parcel even if most have more like 4 or 5 of them. Asked when she's doing the pruning of her parcels, Judit says she usually begins in the middle of january and it may last until the end of february, it depends of the snow and weather conditions. In winter they also work in the cellar, doing some racking, so when the weather is not suited for pruning they go back to the cellar. I say it's probably very cold then in january to work in the vineyard, she says yes, but after the first week of january has passed, her husband József who is mostly in charge of the vineyard management begins to feel the need to go back outside in the parcels and begin to work, he really feels well working outside, even if for just 2 hours at a time. Judit and her family live in the village of Bodrogkisfalud near Tokaj, 900 people live there and she's doing a lot of voluntary work for the village life in spite of her busy schedule, like the day I showed up she had to do some organizing work for the local children. She collected private donations in the previous years through a carnival and wine auctions and things like that and they managed to fund a skate park for local children who before that used to ride their BMX bikes along the roads with the dangerous traffic around. They had this cement slab poured on the village grounds near the church so that they could have fun with their bikes and skate boards without risking their life on the public roads. They all helped by giving a hand to do the finishing of the surface. These days she and other parents organized a sport camp for the children with a few adults and experts with BMX bikes taking part and the teenagers are very excited. The day before they had a boat trip together, it was very nice. Informative story (in English) on Bott Pince by Niklas Jorgensen of Wine Virtuosity (2013).